A very fine apple first described in 1867. Widely sold throughout the South and prized for its fresh eating qualities. 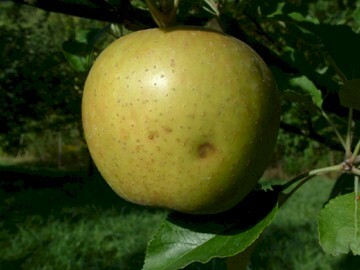 A North Carolina in 1870 stated: “Regarded by leading pomologists as the highest flavored apple in cultivation.” Fruit is medium to large with smooth, waxy, greenish-yellow skin. Flesh is white or yellowish, aromatic, tender, crisp, and fine-grained. Ripens September to October and is a fairly good keeper.